You are rather forced to make these changes. Keep in mind, though, that health is basically good all year. So these scares will remain just that – scares. Health does become more delicate – but only temporarily – after the 23rd. Pay more attention to your heart (especially older Aquarians), and rest and relax more. A good night’s sleep – an afternoon nap when you feel tired – will cure most of what ails you. Keep energy levels high. This month (from the 4th to the 23rd) pay more attention to your kidneys and hips. Regular hip massage will work wonders. If there is dirty laundry in your relationship that hasn’t yet been dealt with, it will come out now. Thus there are changes coming in your spiritual practice, spiritual teachers, attitudes and approach. New revelations will reveal the need for these changes.Last month on the 21st your love planet entered your 6th house. It will be there until the 23rd of this month. This shows that the workplace is a venue for love. Job-seekers (who should be successful this month) are looking at the social aspects of a job as well as the usual things (pay, benefits, working conditions, etc.). These are the aspects for an office romance. Colleagues might also be playing cupid. 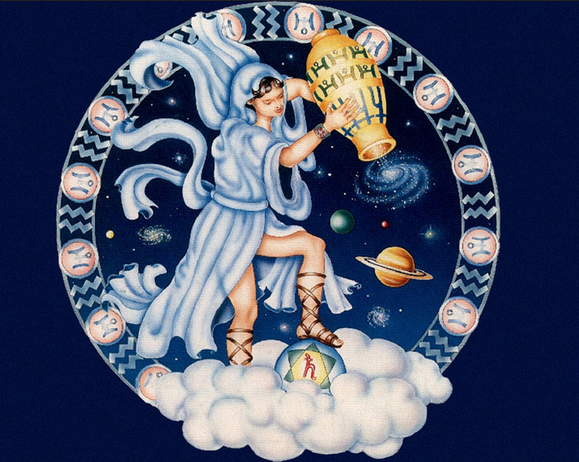 If you are interested in attracting an Aquarius this period, do things for him or her – serve his or her interests. Show an interest in his or her health. After the 23rd, your love planet moves into its own sign and house – the 7th house. This initiates a yearly social peak. The 22nd, 23rd and 24th seem especially strong romantic days – whether you are attached or unattached. Love is still about having fun – but you are a bit more serious. You want to have fun with people who are ‘marriage material’. You are interested in more long-term love. After the 23rd the planetary power makes an important shift to the upper half of your horoscope. Dawn is breaking in your year. Time to get up, get out there and pursue your outer goals. Family is important, of course, but you serve them by being successful at what you do. This shift will get stronger in coming months.